Some may call this junk… Me, I call them treasures. Putting things in containers and workshops is old school. Let the hoarder in you revel in the glory of hoarding absolutely everything, and put it on display in a marvelous, gargantuan pile of treasure. 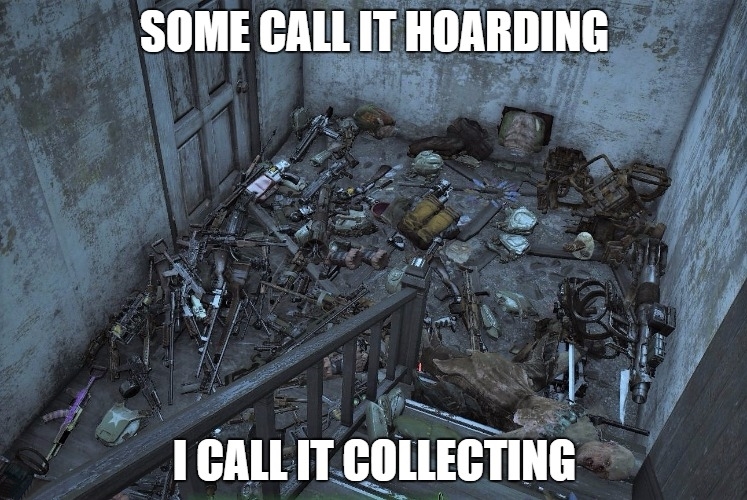 Remember, it’s not hoarding until someone calls you a hoarder. Ergo, it isn’t a problem until there’s an intervention. Thanks to the people at ‘The Slog’ for letting me use their pool for this one. This is where I realized it had become a problem though. The intervention (this time) concerned my nuka cola addiction, or the hoarding of them. On one hand, there was always a nuka cola one could cool down in the pool. On the other, it revealed a compulsive disorder.